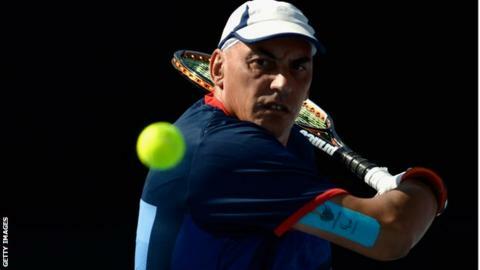 Double Paralympic champion Peter Norfolk has announced he will no longer play full-time wheelchair tennis. The 52-year-old, who won gold in 2004 and 2008 and was the ParalympicsGB flagbearer at the London 2012 opening ceremony, is now unlikely to compete at the Rio Games in 2016. Norfolk, nicknamed the Quadfather, has also left the Tennis Foundation's performance programme. Peter Norfolk won the inaugural quad singles Paralympic title in Athens in 2004, to become Great Britain's first Paralympic tennis gold medallist. "It is time to dedicate some of my time to other areas of my life," he said. Norfolk, who took up wheelchair tennis after a motorcycle accident in 1979 left him with a spinal cord injury, will spend more time with his family and developing his business - a specialist mobility company. He will still compete in some international tournaments, but is reducing his commitments following a 12-year career that has also seen him win the Australian Open five times and US Open twice. "I have enjoyed some incredible moments in my career and I want to thank everyone who has been a part of that, especially those who have given up their time and efforts to help me get to the top," said Norfolk, who won doubles silver at London 2012. "I look forward to staying involved with the Tennis Foundation and I hope I can inspire more disabled people in this country to take up tennis, as it's such a brilliant and fun sport to play."